Merry Christmas, Happy New Year, and happy holidays to all from TheTransitCamera. 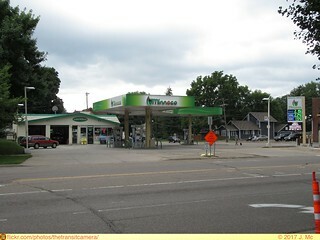 This is the first of what I hope will eventually become a series of street tours around the Twin Cities area. The idea is to simply pick a stretch of a certain street, walk along the length of it, and take photos of whatever looks interesting. 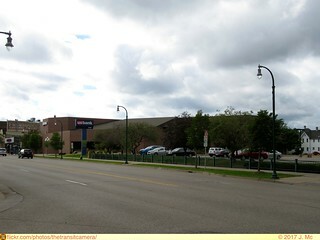 This is a street tour from Cleveland Avenue and Marshall Ave in Saint Paul, MN, to Lake Street and the Minnehaha Center plaza in Minneapolis, MN. This was taken on August 17th, 2017. Starting off at Cleveland and Marshall, we have a two story mixed-use building in the southeast corner of the intersection. 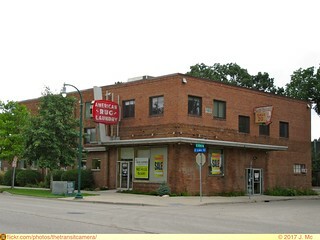 The ground floor is home to Choo Choo Bob's Train Store, a Martial Arts studio, and a few other businesses, with apartments located on the upper level. This building likely dates back to streetcar era days. 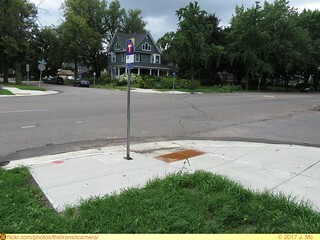 Heading west, some new curb cuts and bus stop pads are seen. This is part of a street improvement project along Marshall Ave to bring curb cuts up to current accessibility standards. 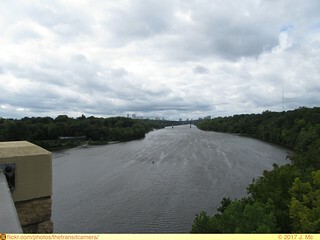 The Mississippi River viewed looking north towards downtown Minneapolis and the University of MN Minneapolis campuses. 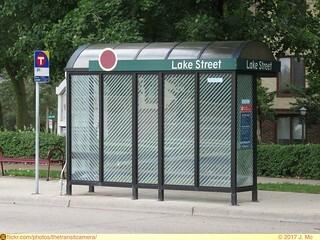 Now in Minneapolis, one of the first changes seen are the custom Lake street branding banners on the bus stop shelters. These were installed as a corridor branding attempt around 10 years ago (give or take). 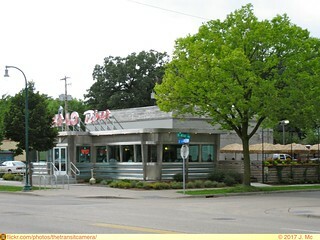 ... and the imported Hi-Lo diner are seen. 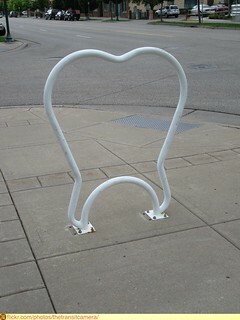 One of the more creative bike rack designs I've seen, this was outside a dentist office. A very industrial looking sign for the Don's Leather Cleaning service building. 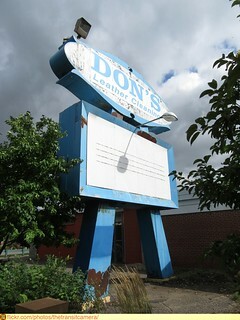 I'm not certain if this has always been Don's or if it was originally something different. 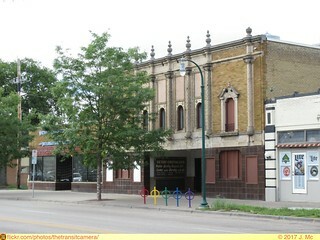 Further along a strip of retail storefronts is seen at 36th and Lake. 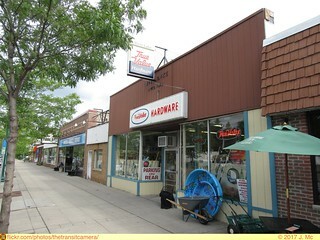 River Lake True Value Hardware is seen front and center. Neighborhood hardware stores are not an easy thing to find any more with the proliferation of the national big-box home improvement chains in the suburbs. I think the lettering over the white sign for the store states "Since 1947" but I can't quite tell as there are numbers missing. 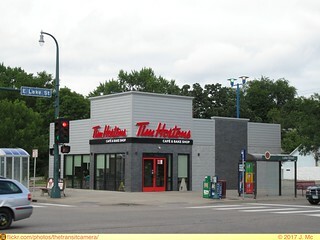 Across the street a new Tim Hortons location has been opened this summer as part of the chain's expansion into the Twin Cities market. 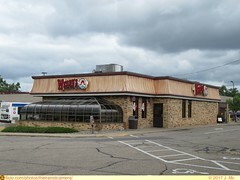 This replaced a former White Castle. Here we see a non-nondescript strip plaza with a laundomat and coffee. Not sure what this would have been before, perhaps a video rental store or some other obsolete retail use. 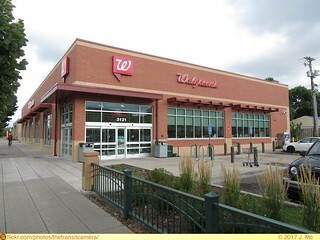 Walgreens Pharmacy has just completed their move into a new location, right next door to their former store! 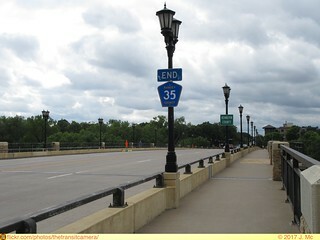 This makes for a nice comparison however in the evolution of design and sidewalk access. 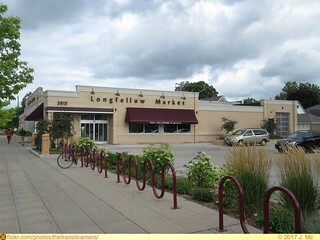 First we see the old store with small windows, a tight sidewalk entry, and bland exterior. Next is the new location with a more welcoming walkway and plaza, bigger windows, and more buffer space between the sidewalk and parking lot. Looking across the street now, there is the old East Lake branch library building, currently home to a merchandising business. A plaque noting the building history can be seen in this photo. Continuing on, the street has a more suburban look. 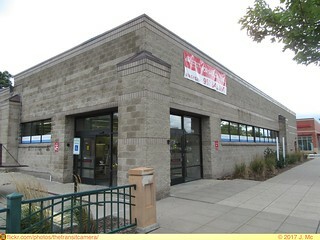 This US Bank branch uses up a whole block with a building and parking lot. I have to wonder if they even use the whole building anymore. 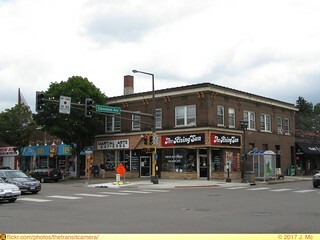 And finally we will end with a couple parting photos at the Minnehaha Plaza shopping center. A former Rainbow Foods is now home to a charter academy of some type, a 1990's look Wendy's sitting in a sea of asphalt, and Cub Foods appears to be getting a facelift. Long term I would expect that some of the plaza area here will be converted to new development with apartments. That brings us to the end of this street tour! Having spent the last, oh, 11+ years using public transit to get places I have had my fair share of experiences and interactions. While the majority of these experiences have been positive, or at least neutral, I have also picked up a few pet peeves over the years. So without further ado, here is a listing of some annoyances that seem to occur regularly. Food: Okay, I honestly don’t care if you want to snack on something simple during your joyride through the hinterlands on one of our awesome buses or hip looking trains while you’re headed to work, school, chainsaw shopping, etc. But seriously, remember there are other people riding with you! So please, keep it neat, quiet, and avoid the smelly stuff. Having a granola bar? Awesome. Can’t wait for your destination to dive in that large deep dish supreme with extra anchovies and garlic? Next time eat in. Whatever you do, please no sunflower seeds. If you need to satisfy your inner squirrel, and tend to spit those shells, please do so somewhere besides my ride home. Phones: Yeah that new smartphone you got really is cool. And I’m very happy to hear that your toenail fungus treatment went well, and will keep in mind that your ex is a complete jerk. Next time though, could you maybe text that information instead, or perhaps wait until you get home or someplace private to call? On a side note folks, there’s this thing called identity theft going on, so it’s probably best to avoid shouting your social security number, credit card account info, or similar tidbits into the phone while riding on public transit. Music or other prerecorded entertainment: Earbuds, headphones, the cone of silence, use one of them please! Socializing: If you want to talk (quietly) with your friends while riding, that’s great. If you’re getting on the vehicle though and your friends are on the platform or sidewalk, please don’t just stand with one foot in the door while you try to catch up on the highlights of the past week. Hey could you... : NO! I will not hold up an entire train of riders, including myself, for “just a minute” while you get off and buy the ticket you SHOULD have bought BEFORE you boarded. We have places to go, transfers to make, appointments, etc. The next train is in ten to fifteen minutes. You don’t matter: Yeah, that’s the feeling I get while sitting on the train for a half hour at a station, with absolutely no explanation for the delay. I don’t need all the details. Just a simple heads up that there is an event down the line causing a delay of at least 15 minutes. This would be greatly appreciated. Language: Yo, for real! NO ONE is thinking you’re cooler or funny cause you cuss away like some rock star, or my friend’s Granny when someone cuts her off in traffic. While these things will not change overnight, I’m sure that there are many transit users who would enjoy a better ride if these behaviors went away... someday. Finally, one section that will be interesting to watch, the future site of the northbound/eastbound A-Line bus station/stop on Ford Parkway at Finn Street. I recall some mention of roughing in station elements with the sidewalk rebuilding, however there has also been mention of station construction occurring next year when Ford Parkway is being repaved/rebuilt. How much is being done now vs. later at this spot is unknown to me. However it is nice to see that the A-Line station is being taken into account. I'd rather see a temporary asphalt or concrete pad in place for now, rather than have a complete new sidewalk and curb ripped out next summer. Of course the best thing would be to pre-build part of the platform ahead of time so as to minimize pedestrian interference. The Mall of America (MOA) is one of the largest indoor shopping malls in the United States, and it's getting larger. Currently the MOA boasts 4.87 million square feet of building area, making it one sizable chunk of property. Access to the MOA is typically by auto, mass transit, or tour bus, although a few pedestrians and cyclists have been spotted on occasion. With more expansion comes more active groundspace, longer walking distances, and of course, parking spots. Additional transit access or coverage is not really included however, with the only future transit plans at MOA calling for an update to the current transit station and garage area. With that in mind, it seems like our big retail friend and tourist hotspot could use something beyond simple pavement and walkways to move visitors around. Walking around the MOA as it is can be tiring, with each floor clocking in at 0.57 miles in distance. While this is fine if you're super hyped about scoring those awesome shoes or actually remembering to buy your girlfriend a nice present for her birthday, it can be kind of a drag if you are coming in to start an eight hour shift at work, or just stopping by to get a new tie. Add in the extra distance to future development, and suddenly scoring that parking space 150' feet closer to the door doesn't seem like a big difference. Incorporating an automated people mover tram system could provide a beneficial transportation solution. My proposal is to connect the IKEA store, the new expansion area, and the MOA core with a new and improved MOA transit station at the existing 28th Avenue site. The mover would operate at frequencies of about 90 seconds to 120 seconds ideally. 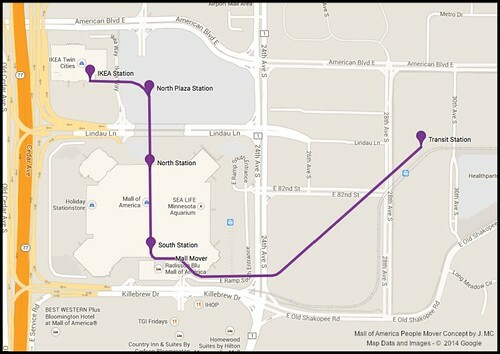 Stations or stops on the line would be at IKEA, the North Plaza expansion area, the north entrance, the south entrance, and 28th Avenue MOA Transit Station. Benefits to mall visitors would be quick access between IKEA, the new expansion development, and the mall core. While this plan is likely to never be more than a simple Google doodle, I hope that the most notorious and largest shopping mall in the United States will incorporate other modes of transportation, and consider walkability, as it continues on with an ever widening footprint. 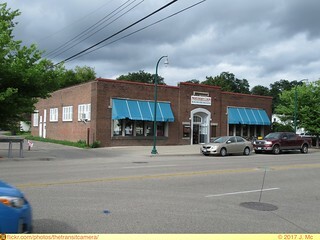 Rainbow Foods, while not a part of the actual Arbor Pointe retail section, was one of the first major businesses to move into the area following housing development. 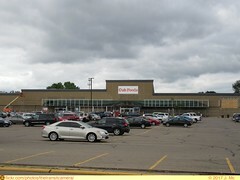 Walmart was the other big business to proceed the development, however a photo was not obtained of that store. 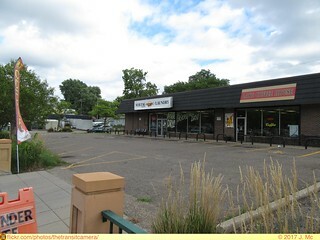 This Rainbow was one of nine in the Twin Cities area that failed to attract any buyers following the decision by Roundy's to sell the chain.This store was originally built in the late 1990's, and seemed to do well in its early years. 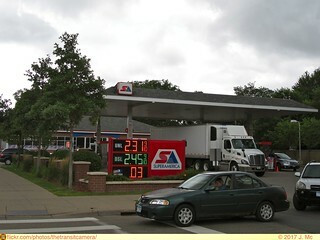 During the recession however they seemed to struggle to attract a steady amounts of customers. For example, when only one of the 15 checkout lines is open, and there's a bell sitting on the conveyor to summon a cashier, you can tell the store is not very busy. 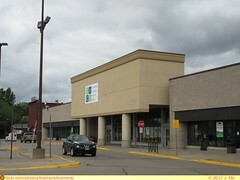 The main sign for the Arbor Pointe Retail Center, seen on the corner of Concord Blvd. and Broderick Blvd. Walgreens closed their Arbor Pointe location after ten years in business.My guess is a lack of steady drive up business and strong competition from the Walmart across the street lead to its demise. Two other Walgreens are still going in Inver Grove, and while both are over towards the north end of town, there may have been some over-saturation of the brand. Advance Auto Parts is another victim, this store closed last year. A Discount Tire is located across Broderick Blvd, so that may have had some impact. Otherwise the lack of easy access into the Arbor Pointe development probably took customers elsewhere. A&W, this one had multiple strikes against its success. The restaurant was located in the interior of the development, limiting visibility from the major streets. Management was also a problem here in my opinion. Poor service and poor quality food are not going to keep customers coming back. The one business that does seem to do well here is banking. Wells Fargo built a branch here in the mid 2000's or so, and is still active today. Another bank also opened a branch here, however they closed the location after a few years. Associated Bank finally leased or bought the building recently though, and seems to be flourishing. It is worth noting that Ruby Tuesday, and a few specialty shops still survive in the development. A new multistory senior living apartment complex was also recently added. What is in store for Arbor Pointe in the future is unknown. If residential development in the area continues to sit without much activity, then there probably won't be much action. If demand does pick up once again, then there will probably be a bit of a retail renaissance. While I'm no development expert, in my opinion a few improvements can be made in the design and layout of the development. The mish-mash of individual lots for each store seems confusing and counterproductive. If I want to grab a new brake light bulb, and then pick up a bottle of asprin at a drugstore, I'm much more likely to go to a location where I can park my car and then walk to each store, instead of pulling into one lot, and then moving the car 500' feet to the other lot, and then driving across the street to grab a snack. It is time once again for my annual Minnesota Dept. of Transportation Transit Report system cost comparison. As before the overall focus of this bit of information is on comparing fixed-route operations from the various agencies across the state. A comparison of 2011 costs can be seen here. This is only a small part of the information contained in the report. 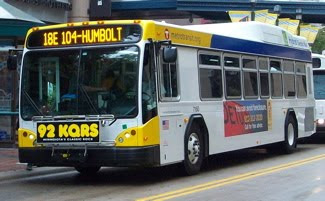 If you have an interest in learning more about these and other transit providers in Minnesota I recommend reading the report in its entirety.